Author Michael Kardos chose “Burn Rubber” as a winner of the 2019 Parent-Writer Fellowship to attend the Martha’s Vineyard Institute of Creative Writing (MVICW)! The prize comes with full tuition and lodging at MVICW in June. I am a writer, a mother, and a wife. I have a day job, and a fiction career. Balancing these endeavors is an ongoing struggle, but I find the energy to keep writing through my network of writers and the support of literary communities like MVICW. Attending conferences and workshops keeps me motivated, and helps me refine my work. MVICW empowers writers, validates our dreams, and helps us bring them to fruition. Awards like this one reinforce the message that committing to our craft is worthy of our time and energy. Thank you to Michael Kardos and MVICW! I am beyond excited to publish my short story collection, Animal Wife, with Red Hen Press! I’ve been writing these stories for the last eight years, and it will be surreal to hold them in my hands, collected between two covers. 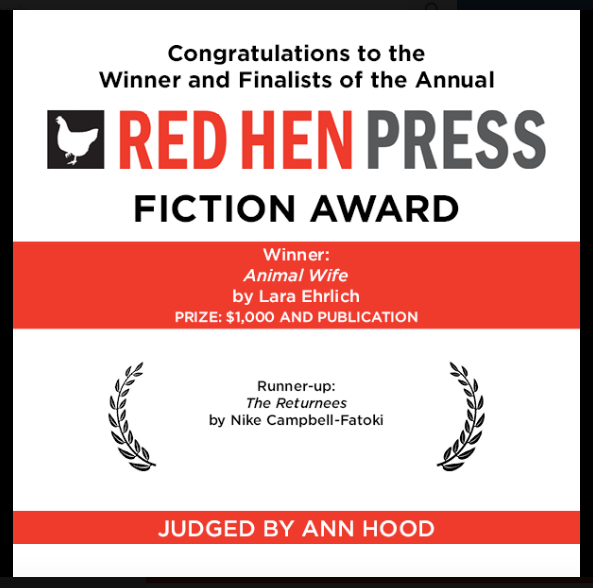 Thank you to Ann Hood for selecting Animal Wife, and to Red Hen for championing it.